Game description: All your favorite Namco classics are now in one package. 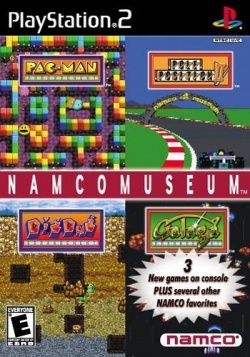 Namco Museum 1 includes Pac-Man, Ms. Pac-Man, Galaga, Galaxian, Dig Dug, and Pole Position. But the fun doesn't stop there, since Namco has added all new arrangement modes plus other hidden games. Whether it's eating ghosts, shooting aliens, digging a hole, or racing toward the finish line, the addictive gameplay of Namco Museum has proven it can stand the test of time. Some editions of the game have the same serial numbers as Namco Museum 50th Anniversary, although this game uses CD media while Namco Museum 50th Anniversary uses DVD.